Sukarno (June 6, 1901 – June 21, 1970) was the first President of Indonesia. He helped the country win its independence from the Netherlands and was President from 1945 to 1967, presiding with mixed success over the country's turbulent transition to independence. Sukarno was forced from power by one of his generals, Suharto, who formally became president in March 1967. Like many leaders of anti-colonial struggles, and of their post-colonial nations, Sukarno opposed capitalism and tended to favor socialism because he associated capitalism with the experience of imperial exploitation. Hence, he turned to communist China and to the Soviet-bloc for assistance. Territorial disputes also featured in his Presidency. Territory traditionally regarded as Indonesian although never united under a single pre-colonial government has been ruled by different imperial powers, and after World War II some areas fell outside independent Indonesia. Borders throughout the world have been defined by colonial interests, rather than by historic or cultural or linguistic ties. Indonesia inherited some territorial anomalies. There were rumors surrounding the coup that toppled him from power in 1967 suggesting CIA involvement. His successor, Suharto distanced himself from Sukarno's pro-communist stance but continued many of his policies, such as discriminating against the ethnic Chinese population, although the national motto is Bhinneka tunggal or unity in diversity. Sukarno was no democrat and he ruled Indonesia for the next 30 years as a dictator, although under his regime the economy did flourish. However, border disputes in Irian Jaya, Aceh and East Timor continued to plague the nation. The spelling "Sukarno" has been official in Indonesia since 1947 but the older spelling Soekarno is still frequently used. Indonesians also remember him as Bung Karno (Bung is an affectionate title used to address colleagues, popular in the early 1900s). Like many Javanese people, he had just one name although in religious contexts he was occasionally referred to as 'Ahmad Sukarno'. The son of a Javanese school teacher and his Balinese wife from Buleleng regency, Sukarno was born in Surabaya, East Java in the Dutch East Indies (now Indonesia). He was admitted into a Dutch-run school as a child. When his father sent him to Surabaya in 1916 to attend a secondary school, he met Tjokroaminoto, a future nationalist. In 1921 he began to study at the Technische Hogeschool (Technical Institute) in Bandung. He studied civil engineering and focused on architecture. An accomplished individual even among the colony's small educated elite, Sukarno distinguished himself by becoming fluent in several languages, especially Dutch (as well as German, English and French and his native Javanese). He once remarked that when he was studying in Surabaya, he often sat behind the screen in movie theaters reading the Dutch subtitles in reverse because the front seats were only for elite Dutch people. Sukarno became a leader of a pro-independence party, Partai Nasional Indonesia when it was founded in 1927. He opposed imperialism and capitalism because he thought both systems worsened the life of Indonesian people. He also hoped that Japan would commence a war against the western powers and that Java could then gain its independence with Japan's aid. He was arrested in 1929 by Dutch colonial authorities and sentenced to two years in prison. By the time he was released, he had become a popular hero. He was arrested several times during the 1930s and was in jail when Japan occupied the archipelago in 1942. In early 1929, during the so-called Indonesian National Revival, Sukarno and fellow Indonesian nationalist leader Mohammad Hatta (later Vice President), first foresaw a Pacific War and the opportunity that a Japanese advance on Indonesia might present for the Indonesian independence cause. In February 1942 Imperial Japan invaded the Dutch East Indies, quickly over-running outmatched Dutch forces who marched, bussed and trucked Sukarno three hundred kilometers to Padang, Sumatra. They intended to keep him prisoner, but abruptly abandoned him to save themselves. The Japanese had their own files on Sukarno and approached him with respect wanting to use him to organize and pacify the Indonesians. Sukarno on the other hand wanted to use the Japanese to free Indonesia: "The Lord be praised, God showed me the way; in that valley of the Ngarai I said: Yes, Independent Indonesia can only be achieved with Dai Nippon… For the first time in all my life, I saw myself in the mirror of Asia." Subsequently, indigenous forces across both Sumatra and Java aided the Japanese against the Dutch but would not cooperate in the supply of the aviation fuel which was essential for the Japanese war effort. Desperate for local support in supplying the volatile cargo, Japan now brought Sukarno back to Jakarta. He helped the Japanese in obtaining its aviation fuel and labor conscripts, called sukarela in Indonesian and Romusha in Japanese. Sukarno was lastingly ashamed of his role with the romusha. He also was involved with Peta and Heiho (Javanese volunteer army troops) via speeches broadcast on the Japanese radio and loudspeaker networks across Java. By mid-1945 these units numbered around two million, and were preparing to defeat any Allied forces sent to re-take Java. On November 10, 1943 Sukarno was decorated by the Emperor of Japan in Tokyo. He also became head of Badan Penyelidik Usaha Persiapan Kemerdekaan Indonesia (BPUPKI), the Japanese-organized committee through which Indonesian independence was later gained. On September 7, 1944, with the war going badly for the Japanese, Prime Minister Koiso promised independence for Indonesia, although no date was set. This announcement was seen as immense vindication for Sukarno's apparent collaboration with the Japanese. Following the Japanese surrender, Sukarno, Mohammad Hatta, and Dr. Radjiman Wediodiningrat were summoned by Marshal Terauchi, Commander-in-Chief of Japan's Southern Expeditionary Forces in Saigon, Vietnam. Sukarno initially hesitated in declaring Indonesia's independence. He and Mohammad Hatta were kidnapped by Indonesian youth groups and taken to Rengasdengklok, west of Jakarta. Finally Sukarno and Hatta declared the independence of the Republic of Indonesia on August 17, 1945. Sukarno's vision for the 1945 Indonesian constitution comprised the Pancasila (Sanskrit - five pillars). Sukarno's political philosophy, "Marhaenism," was defined as Marxism as applied to the conditions in Indonesia. Other elements of influence were nationalism and Islam. The Indonesian parliament, founded on the basis of this original (and subsequently revised) constitution, proved all but ungovernable. This was due to irreconcilable differences between various social, political, religious and ethnic factions. Sukarno's government initially refused to form a national army, for fear of antagonizing the Allied occupation forces had their doubt over whether they would have been able to form an adequate military apparatus to maintain control of seized territory. The various militia groups at that time were encouraged to join the BKR—Badan Keamana Rakyat (The People's Security Organization) - itself a subordinate of the "War Victims Assistance Organization." It was only in October 1945 that the BKR was reformed into the TKR—Tentara Keamanan Rakyat (The People's Security Army) in response to the increasing Dutch presence in Indonesia. In the ensuing chaos between various factions and Dutch attempts to re-establish colonial control, Dutch troops captured Sukarno in December 1948, but were forced to release him after the ceasefire. He returned to Jakarta in December 28, 1949. At this time, Indonesia adopted a new constitution that made the country a federal state. This was replaced by another provisional constitution in 1950 that restored a unitary form of government. Both constitutions were parliamentary in nature, making Sukarno a figurehead. However, even with his formally reduced role, he commanded a good deal of moral authority as Father of the Nation. Sukarno's government was not universally accepted in Indonesia. Many factions and regions attempted to separate themselves from his government; there were several internal conflicts resulting in kidnapping and murders of religious leaders and government officials, even during the period of armed insurgency against the Dutch. The communist-backed coup attempt by elements of the military in Madiun, East Java in 1948, led to a crackdown against communists in Indonesia. There were further attempts of military coups against Sukarno in 1956, including the PRRI-Permesta rebellion in Sulawesi supported by the CIA, during which an American aviator, Allen Lawrence Pope, operating in support of the rebels was shot down and captured. Sukarno resented his figurehead position and used the increasing disorder to intervene more in the country's political life. Claiming Western-style democracy wasn't suitable for Indonesia, he called for a system of "guided democracy" based on what he called traditional Indonesian principles. The Indonesian way of deciding important questions, he argued, was by way of prolonged deliberation designed to achieve a consensus. He proposed a government based not only on political parties but on "functional groups" composed of the nation's basic elements, in which a national consensus could express itself under presidential guidance. During this later part of his presidency, Sukarno came to increasingly rely on the army and the support of the Communist Party of Indonesia (PKI). In the 1950s he increased his ties to China and admitted more communists into his government. He also began to accept increasing amounts of Soviet bloc military aid. This aid, however, was surpassed by military aid from the Eisenhower Administration, which worried about a leftward drift should Sukarno rely too much on Soviet bloc aid. However, Sukarno increasingly attempted to forge a new alliance called the "New Emerging Forces," as a counter to the old superpowers, whom he accused of spreading "Neo-Colonialism, Colonialism and Imperialism." His political alliances gradually shifted towards Asian powers such as the PRC and North Korea. In 1961, this first president of Indonesia also found another political alliance, an organization, called the Non-Aligned Movement (NAM, in Indonesia known as Gerakan Non-Blok, GNB) with Egypt's President Gamal Abdel Nasser, India's Prime Minister Pandit Jawaharlal Nehru, Yugoslavia's President Josip Broz Tito, and Ghana's President Kwame Nkrumah, in an action called The Initiative of Five (Sukarno, Nkrumah, Nasser, Tito, and Nehru). This action was a movement to not give any favour to the two superpower blocs, who were involved in the Cold War. The Bandung Conference was held in 1955, with the goal of uniting developing Asian and African countries into a non-aligned movement to counter against the competing superpowers at the time. 1n 1956, Sukarno visited the Soviet Union, the People's Republic of China, as well as the United States. In order to increase Indonesia's prestige, Sukarno supported and won the bid for the 1962 Asian Games held in Jakarta. Many sporting facilities such as the Senayan sports complex (now Bung Karno Stadium), and supporting infrastructure were built to accommodate the games. There was political tension when the Indonesians refused the entry of delegations from Israel and the Republic of China. On November 30, 1957, there was a grenade attack against Sukarno when he was visiting a school in Cikini, Central Jakarta. Six children were killed, but Sukarno did not suffer any serious wounds. In December he ordered the nationalization of 246 Dutch businesses. In February he began a breakdown of the Pemerintah Revolusioner Republik Indonesia rebels at Bukittinggi. These PRRI rebels, a mix of anti-communist and Islamic movements, received arms and aid from Western sources, including the CIA, until J. Allan Pope, an American pilot, was shot down in northern Indonesia in 1958. The downing of this pilot, together with impressive victories of government forces against the PRRI, evoked a shift in US policy, leading to closer ties with Sukarno as well as Major General Abdul Haris Nasution, the head of the army and the most powerful anti-communist in the Jakarta government. Sukarno also established government control over media and book publishing as well as laws discriminating against Chinese Indonesian residents. On July 5, 1959 he reestablished the 1945 constitution by presidential edict. It established a presidential system which he believed would make it easier to implement the principles of guided democracy. He called the system Manifesto Politik or Manipol - but was actually government by decree. He sent his opponents to internal exile. 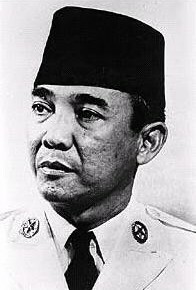 In March 1960 Sukarno dissolved the elected Assembly and replaced it with an appointed Assembly, which brought the military into his government for the first time. In August he broke off diplomatic relations with the Netherlands over Dutch New Guinea (West Papua). After West Papua declared itself independent in December of 1961, Sukarno ordered raids on West Irian (Dutch New Guinea). In September 1960, he addressed the United Nations over the issue of West Irian, having broken diplomatic relations with the Netherlands in August. The following April, visiting the United States, he told John F. Kennedy that he would oppose communism in return for US support. As a non-aligned nation, his foreign policy was balanced between the East and the West. There were more assassination attempts when he visited Sulawesi in 1962. West Irian was brought under Indonesian authority in May 1963 under the Bunker Plan. In July of the same year he had himself proclaimed President for Life by the Assembly. While the western media eagerly portrayed him as an autocratic despot, Sukarno's rule was actually much milder than was often the case for Third World authoritarian governments of the time. Executions or political gulags were unheard of under Sukarno's rule (he was even known for maintaining personal friendships with some of his staunchest political enemies), and even his radical move to the left, soon followed by political repression of forces considered to be rightist, were based on his actual beliefs that Britain and the US were sabotaging his Indonesian revolution. Meanwhile the PKI communist party leaders were systematically confiscating properties from the British, from Buddhists, from foreigners and wealthy landowners as the movement toward making Indonesia a communist nation progressed. Sukarno also opposed the British-supported Federation of Malaysia, claiming that it was a neocolonial plot to advance British interests. In spite of his political overtures, which was partly justified when some political elements in British Borneo territories Sarawak and Brunei opposed the Federation plan and aligned themselves with Sukarno, Malaysia was proclaimed in September 1963. This led to the Indonesia-Malaysia confrontation (Konfrontasi) and the end of remaining US military aid to Indonesia. Sukarno withdrew Indonesia from the UN Security Council in 1965 when, with US backing, the nascent Federation of Malaysia took a seat. Sukarno's increasing illness was demonstrated when he collapsed in public in August 9, 1965, and he was secretly diagnosed with kidney disease. Sukarno tried to balance the various modalities that competed for supremacy, especially Islam, communism and the ever-watchful military. This informed the four principles that guided the state philosophy, and which would influence Sheikh Mujibur Rahman of Bangladesh. To some extent he succeeded. Certainly, he did much as Father of the Nation to form a coherent nation out of what was left behind by the colonial powers. September 25, 1965 Sukarno gave a speech stating that Indonesia was entering the "second phase of the revolution", which would be the "implementation of socialism". At this time Indonesia was reeling from rice shortages and high inflation, leading to massive corruption across the nation. Sukarno had ordered the IMF and the World Bank to leave, considering their efforts to contol the runaway inflationary economy to be post-colonial meddling. On the night of September 30, 1965, six of Indonesia's top anti-communist generals were kidnapped, tortured and killed and thrown down a well at Lubang Buaya (literally translated: Crocodile Dungeons) Area, East Jakarta. While the PKI was blamed for instigating a supposed coup attempt, some evidence indicates Sukarno's supporters were behind it, fearing the rise of anti-communist factions, both inside the military and the country as a whole. One survivor, the staunchly anti-communist General Abdul Haris Nasution, escaped the murder plot, but lost his youngest daughter, Ade Irma Suryani Nasution, and his aide-de-camp, Lieutenant Pierre Tendean. The events of that night are referred to as "G30S/PKI," an abbreviation of "Gerakan 30 September," or "the September 30th Movement." For his own safety, Sukarno fled to safety of Hallim Air Force base, while coup leaders and army rebels swarmed the central plaza of Jakarta, in an attempt to take over the nation. Six days later Sukarno denounced the coup. He blamed rebellion in the army for the failed coup. Major General Suharto, commander of the Army's strategic reserves, and the rest of the military, began a crackdown on the PKI (Communist Party). The loyalist army encouraged anti-communist organizations and individuals to join in eliminating remnants of the coup, which led to the killing of anyone suspected of being a communist sympathizer. The killings were concentrated in Sumatra, East Java and Bali. By spring of 1966, estimates ranging from one-hundred thousand to half a million Indonesians had been killed by soldiers, police and pro-Suharto vigilantes. The Muslims of Indonesia announced their anti-communist position. Students rioted on news of a document that implicated Chinese embassy officials. The embassy of the People's Republic of China was overrun by demonstrators and looted, and ethnic Chinese Indonedians were targeted, both those supporting Taiwan and Beijing. Sukarno's grip on power was weakened by the crisis, while Suharto used the situation to strengthen his own hand. On March 11, 1966, Suharto and his supporters in the military forced Sukarno to issue a Presidential Order called Supersemar (Surat Perintah Sebelas Maret - The March 11 Order), in which Sukarno yielded all executive powers to Suharto in order to restore peace. After obtaining the Presidential Order, Suharto had the PKI abolished and declared them an illegal party. He also arrested many high ranking officials who were loyal to Sukarno on the charge of being a communist/PKI members and/or symphatizers, further reducing Sukarno's political power and influence. Subsequently all reports and possible documents containing information about the September 30 Movement were destroyed, leaving much speculation as to the actual causes of events that followed. In 1991 a government minister admitted that the national archives only possessed a copy of this letter, and in 1992 another government minister called for whoever is in possession of the original document to submit it to the national archives. However, there is testimony from several eyewitnesses who claim that such a document did exist and that the copy in the archives is a faithful reproduction of the original. Sukarno was stripped of his presidential title by Indonesia's provisional parliament on March 12, 1967, led by his former ally, Nasution, and remained under house arrest until his death at age 69 in Jakarta in 1970. He was buried in Blitar, East Java, Indonesia. In recent decades, his grave has been a significant venue in the network of places that Muslim Javanese visit on ziarah, the tradition of pilgrimage during Ramadan to places associated with Islam, and for some Indonesians, is of equal significance to those of the Wali Songo, the nine saints who spread Islam in Indonesia. Megawati Sukarnoputri, who served as the fifth president of Indonesia, (2001–2004) is Sukarno's daughter. There is still speculation about who triggered the crisis that led to Sukarno's removal from power. One version claims that the Indonesian Communist Party (PKI) ordered the murders of the six generals; others blame Sukarno, and still others believe Suharto orchestrated the assassinations to remove potential rivals for the presidency. Several documentaries (from the BBC, ITV and independent journalists such as John Pilger's The New Rulers of the World) have also been made the last decades, that imply CIA involvement, some before the 1990s release of official CIA documents. Adams, Cindy Heller. My Friend the Dictator Indianapolis: Bobbs-Merrill, 1967. Hering, Bob, Soekarno, architect of a nation, 1901-1970. Amsterdam: KIT Publishers Amsterdam, 2001. ISBN 9068325108. Smith, Roger M. (ed). Southeast Asia. Documents of Political Development and Change. Ithaca, NY: and London: 1974. 174-183. U.S. Central Intelligence Agency, Research Study: Indonesia —The Coup that Backfired. Washington, D.C.: 1968, 71n. All links retrieved October 26, 2015. The National Security Archives The Official US position on released CIA documents Non-governmental library located at George Washington University. Ralph McGehee, Covert Action Quarterly, Fall 1990 Report from former CIA officer assigned to Indonesia. "The Indonesian Massacres and the CIA." This page was last modified on 26 October 2015, at 14:32.